“Oliver Crisp was only ten years old, but they had been a very busy and exciting ten years, because Oliver’s mother and father were explorers. They met on the top of Mount Everest. Oh Oliver and the Seawigs, I did not want to put you down, even after I had finished you! This book is the perfect remedy for when you are down in the dumps because it will drag you out of them and cheer you up in no time at all! The story was fantastic and I loved the amazing adventure that Oliver took with his new found friends. I loved that each of them found out more about what it is like to truly be yourself and that what other people think doesn’t really matter. Oliver and his friends aren’t the biggest or the bravest but when they join forces they really are the best. The story was awash with new adventures, lessons to be learnt and evil sea monkeys to contend with, and all the way through it was just brilliant. The characters were brought to live by the amazing illustrations by Sarah McIntyre and I loved those so much, there was so much going on in the pictures that you could honesty just sit and stare at them. I have a vivid imagination but some of the things in this book would have been impossible to picture without the illustrations, I’m thinking the seawigs in particular, and I think the illustrations really do add to the story. Sometimes illustrations are there to accompany the text rather than bring anything to the table themselves but that is not the case in Oliver and the Seawigs and I don’t think it would have been the same story without it. I have only ever read a short story by Philip Reeve before this book and I must say its a fantastic introduction to him as an author. The writing has a perfect flow and was easily read, it was full of adventure and I was begging to turn the page and find out what would happen next. The book is aimed at the 7 plus audience but I think anyone, any age would love this book and I can’t wait to read it to my kids one day as its definitely a keeper! I am also so happy that this book won’t be a one off form the pair and there will be another three coming from OUP, I can’t wait to find out what they are and if they all contain Oliver and Iris as I love them as the pair of main characters, but I’m sure I won’t be disappointed by any of the books which are written and illustrated by Philip and Sarah! 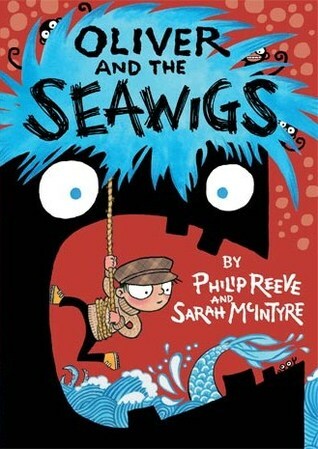 Oliver and The Seawigs will be published on September 5th by Oxford University Press. My copy was sent to me from the publisher in exchange for an honest review.